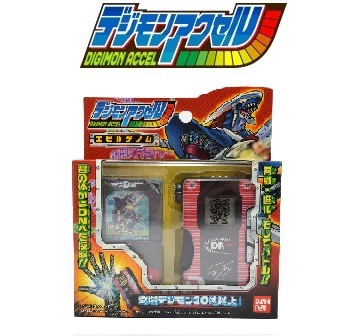 Digimon Accel Evil Genome (デジモンアクセル イビルゲノム) alongside with the Digimon Accel Justice Genome is the first wave release of the Digimon Accel Virtual pet. Missimon: Dragon 0-5, Dark 0-5, Machine/Mutant 20. Missimon: Dark 0-5, Dragon 11-15, Machine/Mutant 20. Missimon: Machine/Mutant 0-5, Dark 0-5, Dragon 20. Missimon: Dragon 0-5, Machine/Mutant 0-5, Dark 20. Missimon: Dark 0-5, Machine/Mutant 11-15, Dragon 20. Missimon: When you do not fulfill the requirements of other Digimon. Penmon: Bird 6-10, Dragon 6-10, Insect/Plants 20. Dracumon: Dragon 0-5, Dark 11-15, Beast 20. Hagurumon: Dark 0-5, Insect/Plants 11-15, Machine/Mutant 20. Gizamon: Water 0-5, Bird 11-15, Beast 20. Gizamon: Bird 0-5, Beast 11-15, Water 20. Dracumon: Dark 0-5, Dragon 11-15, Beast 20. Tentomon: Dragon 0-5, Insect/Plants 11-15, Holy 20. Commandramon: Bird 0-5, Machine/Mutant 11-15, Dragon 20. Tentomon: Holy 0-5, Insect/Plants 11-15, Dragon 20. Dracumon: Dragon 0-5, Beast 11-15, Dark 20. Penmon: Bird 0-5, Insect/Plants 11-15, Dragon 20. Hagurumon: Insect/Plants 0-5, Machine/Mutant 11-15, Dark 20. Penmon: Insect/Plants 0-5, Dragon 11-15, Bird 20. Commandramon: Machine/Mutant 0-5, Dragon 11-15, Bird 20. Tentomon: Holy 6-10, Insect/Plants 6-10, Dragon 20. Hagurumon: Dark 6-10, Machine/Mutant 6-10, Insect/Plants 20. Commandramon: Bird 6-10, Machine/Mutant 6-10, Dragon 20. Gizamon: Beast 6-10, Water 6-10, Bird 20. Dobermon: Dragon 6-10, Holy 6-10, Beast 20. Meramon: Insect/Plants 6-10, Bird 6-10, Machine/Mutant 20. Thunderbirmon: Bird 0-5, Holy 6-10, Dragon 20. Snimon: Insect/Plants 0-5, Bird 0-5, Beast 20. Sealsdramon: Dark 0-5, Machine/Mutant 0-5, Dragon 20. Sealsdramon: Dark 0-5, Machine/Mutant 11-15, Dragon 20. Dobermon: Holy 0-5, Beast 6-10, Dragon 20. Gekomon: Water 0-5, Insect/Plants 11-15, Dark 20. Sangloupmon: Beast 0-5, Machine/Mutant 0-5, Dark 20. 50% or more Win Ratio. Snimon: Insect/Plants 0-5, Beast 6-10, Bird 20. Gekomon: Water 6-10, Dark 6-10, Insect/Plants 20. Sangloupmon: Dark 0-5, Beast 6-10, Machine/Mutant 20. Thunderbirmon: Bird 6-10, Dragon 11-15, Holy 20. Meramon: Bird 0-5, Insect/Plants 0-5, Machine/Mutant 20. Volcamon: Insect/Plants 0-5, Dark 11-15, Machine/Mutant 20. Marin Devimon: Water 0-5, Dragon 11-15, Dark 20. Tankdramon: Dragon 0-5, Dark 11-15, Machine/Mutant 20. Zudomon: Holy 6-10, Beast 11-15, Water 20. Hippogriffomon: Bird 6-10, Beast 11-15, Water 20. Tankdramon: Dark 6-10, Machine/Mutant 11-15, Dragon 20. Angewomon: Holy 0-5, Bird 6-10, Dragon 20. Matadrmon: Beast 11-15, Machine/Mutant 11-15, Dark 20. 60% or more Win Ratio. Scorpiomon: Dragon 0-5, Insect/Plants 11-15, Dark 20. 60% or more Win Ratio.